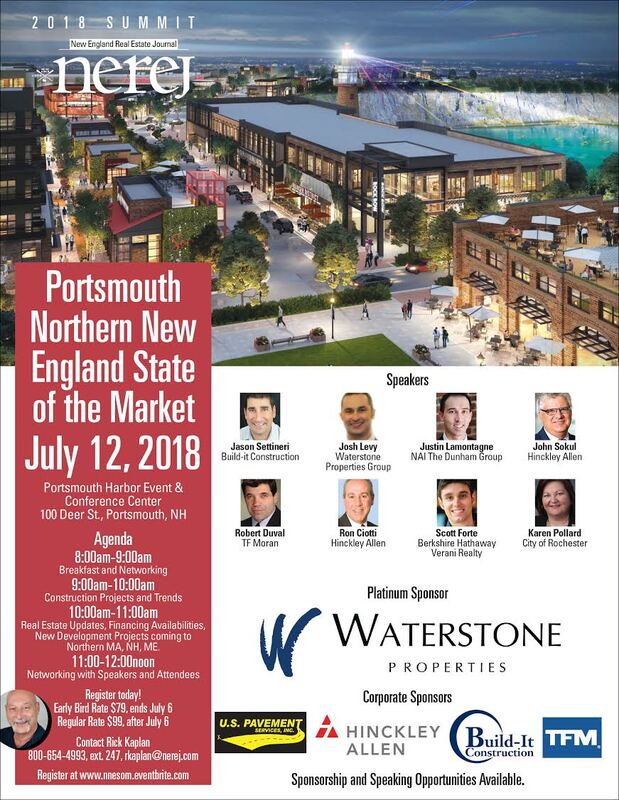 On Thursday July 12, 2018 New England Real Estate Journal will be hosting the Portsmouth Northern New England State of the Market Summit at the Portsmouth Harbor Events & Conference Center in Portsmouth, NH. After the networking breakfast, TFMoran’s president and chief engineer, Robert Duval, PE will be speaking on the panel, covering the topic “Construction Projects and Trends” during the 9:00am session. Additional topics to be discussed are Real Estate Updates, Financing Availabilities, and New Development Projects coming to Northern MA, NH, and ME. Following the panel discussion, attendees will have another opportunity to network with the speakers: Jason Settineri of Build-it Construction; Josh Levy of Waterstone Properties Group; Justin Lamontagne of NAI The Dunham Group; John Sokul of Hinckley Allen; Robert Duval of TFMoran; Ron Ciotti of Hinkley Allen; Scott Forte of Berkshire Hathaway Verani Realty; and Karen Pollard of City of Rochester. TFMoran’s Portsmouth division manager and principal, Corey Colwell, LLS and Dylan Cruess, TFMoran’s COO, will be on hand for networking. Thanks to Rick Kaplan and New England Real Estate Journal staff for putting on this great event, and for all the other sponsors, Waterstone Properties, U.S. Pavement Services, Hinkley Allen, and Build-It Construction. Last year nearly 150 people attended this vibrant and engaging Summit, we are eagerly awaiting to see how many people attend this year’s event. Hope to see you there! John Lorden, PE, Senior Project Manager at MSC: a Division of TFMoran, Inc., wrote a feature article on the future expansion of Atlantic Orthopedics & Sports Medicine in the April 3rd edition of the New England Real Estate Journal. MSC, the Portsmouth, NH division of TFMoran provided survey, civil/site engineering and permitting for two 20,000sf medical office buildings at 1900 Lafayette Road in Portsmouth, NH. Atlantic Orthopedics & Sports Medicine, will occupy one building along with an MRI coach and future MRI addition. The project team includes general contractor BBL Medical Facilities and architect HCP Architects, both of Albany, NY. All of the project team members have worked closely with Atlantic Orthopedics & Sports Medicne since the initial planning stages of this exciting project. Portsmouth, NH – The final vacant lot along Lafayatte Road (US Route 1) in Portsmouth’s Office/Residential zoning district will soon be home to Atlantic Orthopedics & Sports Medicine’s new facility. MSC a division of TFMoran, Inc., recently received planning board approval for two new office buildings. Construction will soon be underway at 1900 Lafayette Road in Portsmouth, as the ground breaking is scheduled for April 2015. Atlantic Orthopaedics & Sports Medicine, currently located at 150 Route 1 Bypass in Portsmouth, will be occupying the new office building closest to Lafayette Road. After considering an expansion to their existing location, Atlantic Orthopedics & Sports Medicine ultimately decided that a new facility would better fit their needs to continue providing quality services to their patients. “The project required a lengthy and challenging permitting process, as details related to stormwater drainage and the complete build-out of a service road connecting local businesses were vital components of the project” explained John Lorden, PE, MSC’s Senior Project Manager. “Ultimately, stormwater drainage was allowed to connect to existing municipal storm drainage via a proposed service road. This connection of the service road located within the Lafayette West Industrial Park will provide additional access to local roads and nearby businesses. The complete build-out of the service road was part of a long-term plan envisioned since the property was subdivided in 1983, when an easement was established allowing access and use to all abutting parcels. The service road will improve access to all parcels along the service road, provide more direct access to Portsmouth Regional Hospital for doctors and patients, and also alleviate some traffic on the heavily traveled corridor,” continued Lorden.